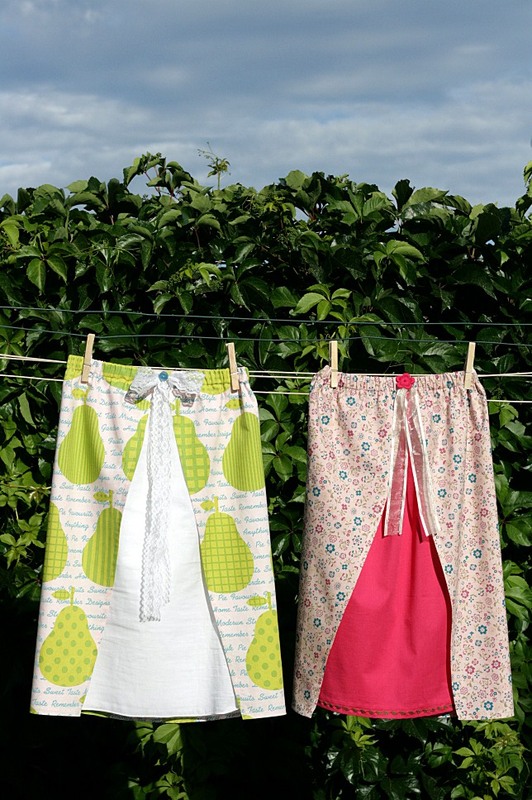 This is a sewing tutorial to make a very easy strapless beach dress “sarong style” for girls. 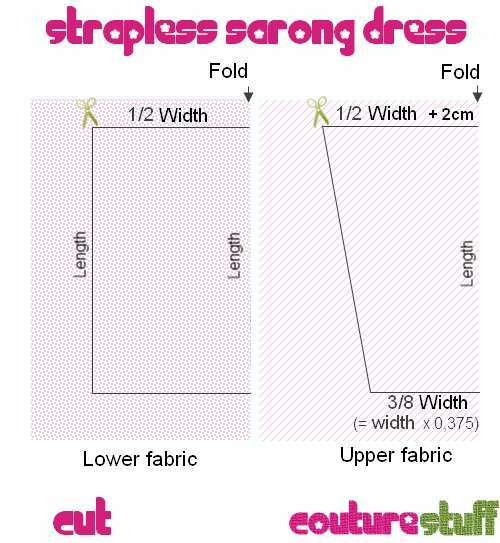 This tutorial can also be used to make a skirt or a tunic, you’ll just need to change the length / width measurements. The dress is quite simple : two layers of fabric attached together at the top with an elastic holding the dress up. The genesis of this strapless girl dress is here and another dress can be seen there. 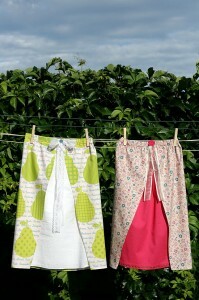 You’ll see, on these articles, pictures of the finished dresses. Measure bust, waist and hips and retain only the largest measurement. To give more fullness to the dress simply add more than 15cm/6 inches. Mea culpa : I’m really bad with drawings, I hope it will stilll be clear enough. 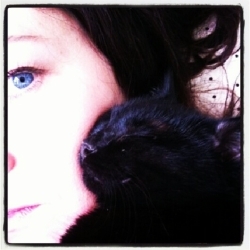 But I assure you, it’s quite simple. We cut on the fold : through a double layer of fabric. 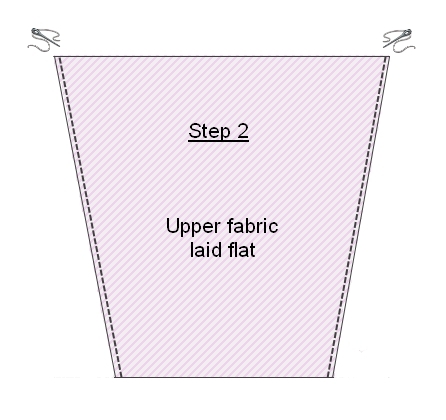 For the upper fabric, we don’t need to calculate the length of the diagonal edge, simply connect the 2 points. 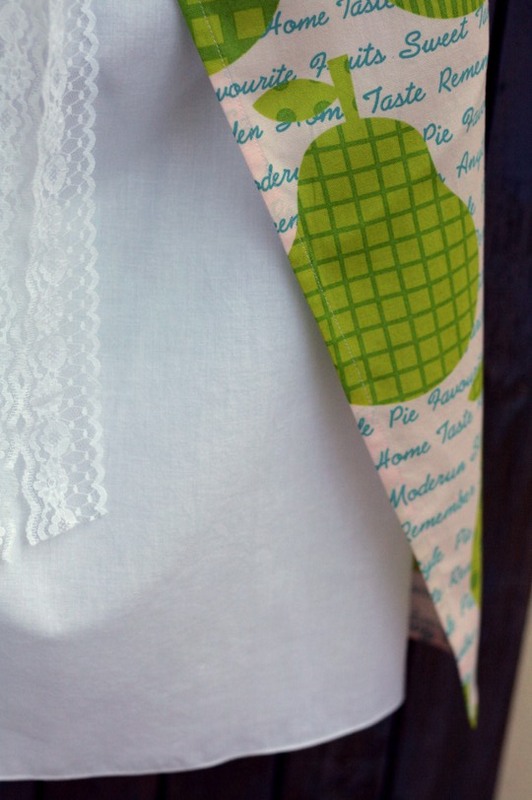 Create a tube : Fold the lower fabric right sides together, aligning the edges. Stitch with a seam allowance of 1 cm. Finish the seam and press it open. This is the center back seam. Finish the raw side edges of the upper fabric, by turning under 1cm. Right side of lower fabric facing wrong side of upper fabric. AND aligning the center back seam of the lower fabric with the center of the upper fabric. Sew using a seam allowance of 0.5 cm, or you can just serge them together as I did. 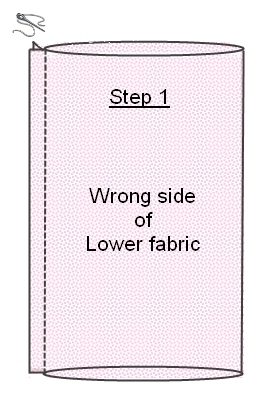 Create an elastic casing at the top of the dress. Don’t forget to leave an opening large enough to thread the elastic ! Slide the elastic in place, adjust its length. 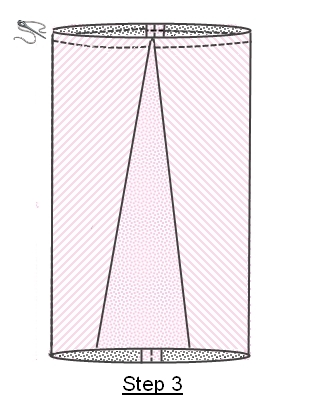 Hem with a narrow hem (1cm) the 2 lower edges separately. On my DD’s dresses I started hemming the upper fabric with a 1cm seam allowance, I then did a slightly deeper hem (1,5cm) on the lower fabric. 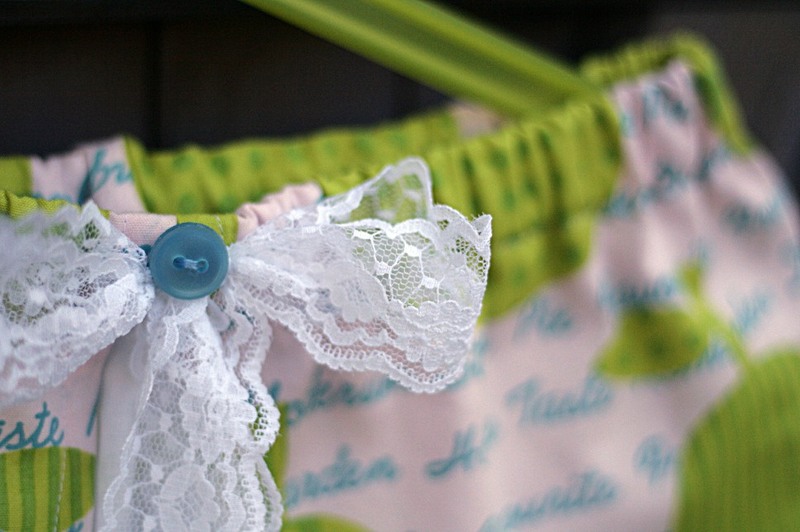 Attach your embellishments (button, ribbon) to the center front of the dress and you’re done ! After a first test of the strapless girl dress, “sarong style” (see here), Petite Chérie loving it, I did a second one for her. 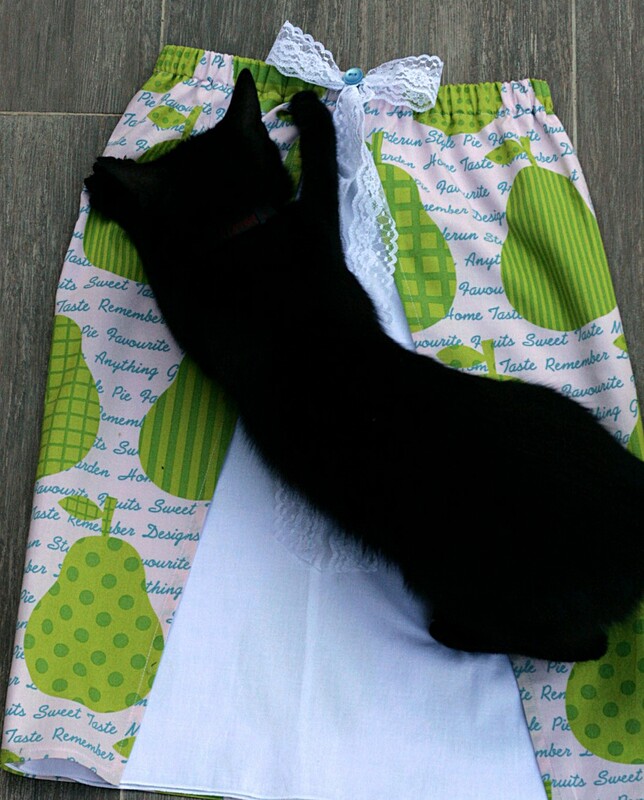 The dress is still very simple and quick to sew so that it’s fine with me that Petite Chérie loves it! The tutorial for this easy sarong / strapless dress is here: Easy sewing : strapless dress ! 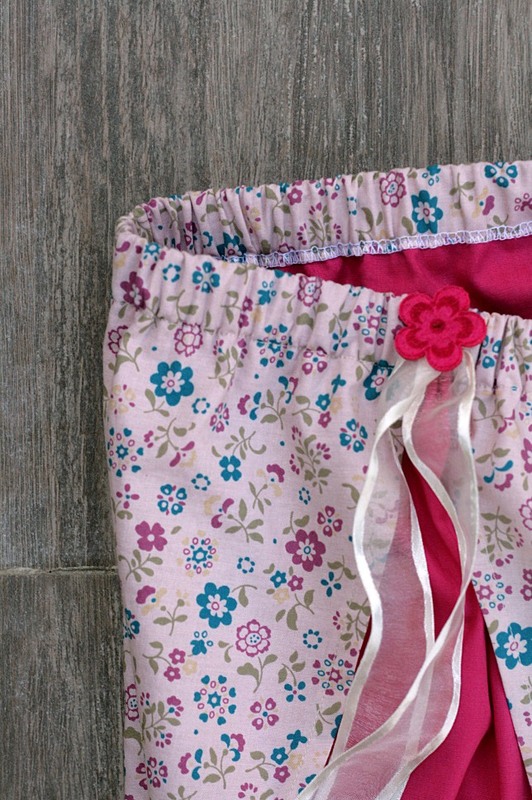 I used a fuchsia cotton fabric as the bottom fabric and a flower printed cotton from Lecien for the top fabric. 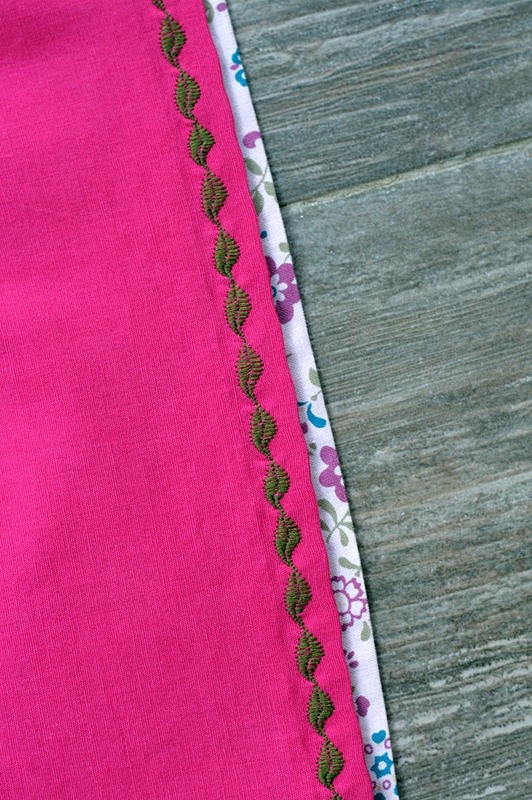 For embellishments : a small ribbon and a fuchsia flower. I didn’t have matching thread for the pink fabric to sew the hem. So, since the seam would be inevitably be seen, I decided to test a “leaf” decorative stitch on my beloved sewing machine (Janome DC4030) with a iridescent green thread. I told myself that it would remind the leaves on the print … In the end it is not truly ugly, but I think I would have preferred a matching thread that would have gone unnoticed. This is a fast and easy summer dress I’ve made for my 7 years old (at the time) daughter. So I imagined this fast and easy dress which is made with two layers of cotton which are gathered together at the top with an elastic. Really fast and easy. She loves to wear this sarong style dress and not only at the beach ! Edited 17/09/2012 : She started out growing the dress (in length) so she now wears it as a tunic. 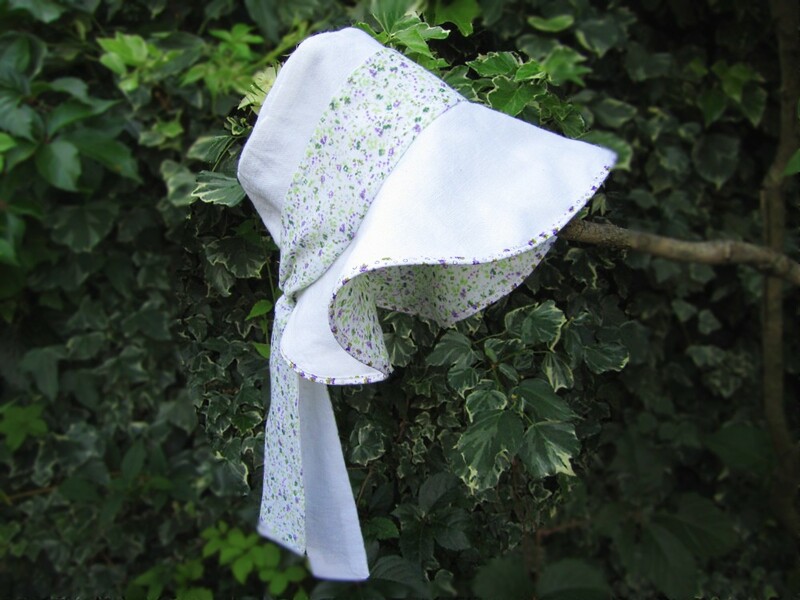 I’ve used a white cotton voile as the under layer and a “pear” Japanese printed cotton by Kokka, as the top layer. Then I thought that something was missing at the center front to remind of the knot in a sarong. 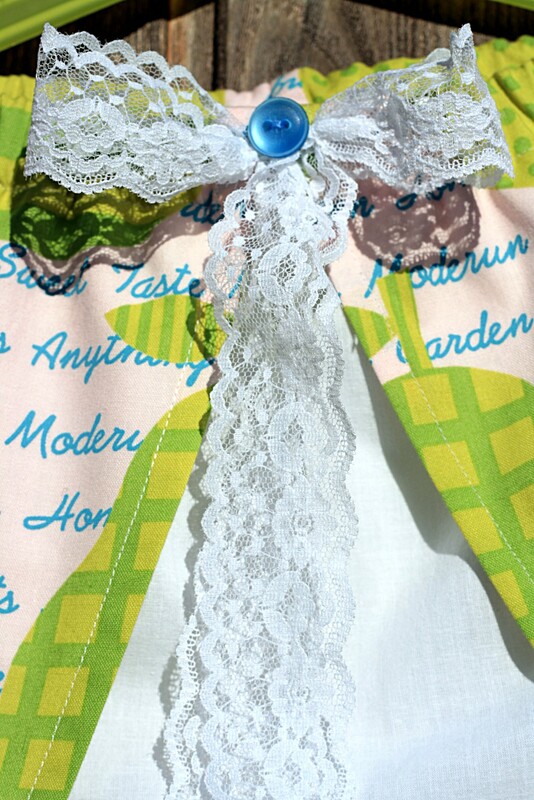 I dug in my stash and added a little white lace piece and a blue button to echo the color of the print. I have a second dress which is almost finished, I shall show it to you soon. Yep I do a lot of these careless mistakes, and this one was really really stupid ! Of course, I washed my fabric before starting cutting…. 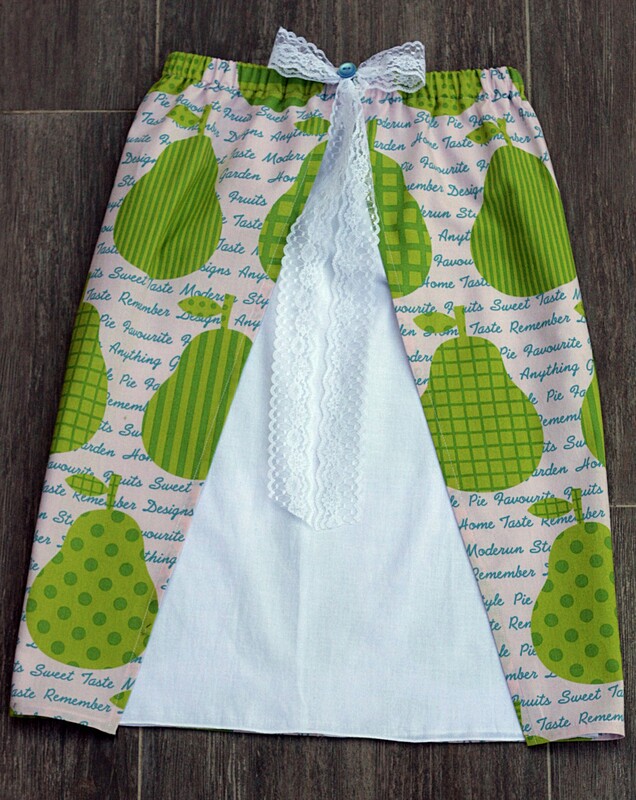 And with these fabrics was the one for the second dress which is a deep fushia… Yes, you got it, the printed “pear” cotton which is suppose to have a white background now has a pink tint ! I told you this one was stupid ! The tutorial for this easy and fast strapless “sarong” dress can be find HERE. 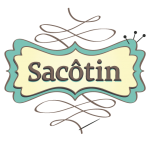 Le tutoriel : couture facile : robe paréo ! This is a free pattern from HotPatterns that you can download here. 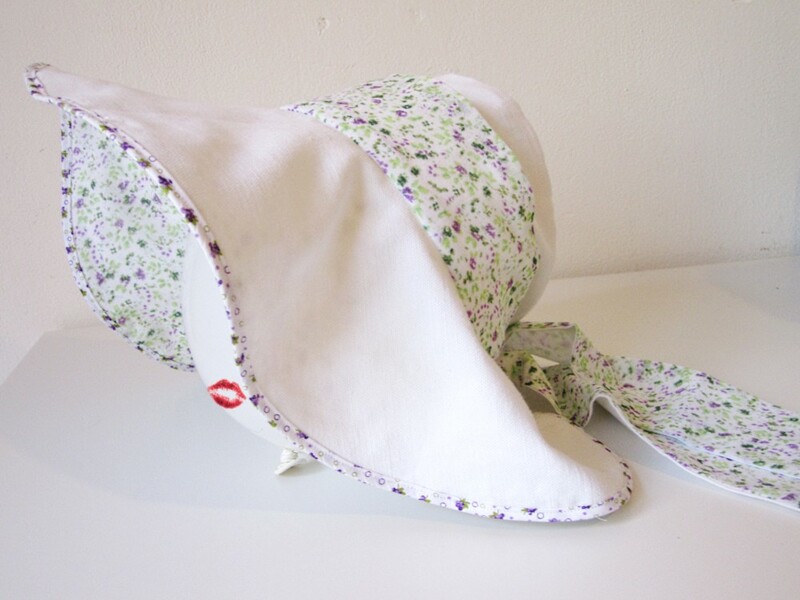 “Protect your gorgeous face and precious skin from the sun this Summer with our fabulously flattering sunhat! This is designed for fabrics with a little body, like denim, drill, canvas or home-dec materials, but you can also use lighter weight fabrics with a canvas interlining. Chic bucket-style hat has an oval crown, high tapered sides and a shaped brim with a center back, baseball-cap style cut-out. Contrast binding finishes the brim edge and a contrast band and tie means you can adjust the hat to fit you perfectly. Yes but this is not for total beginners (it’s rated advanced beginner by Hot Patterns), the instructions are minimal and the drawings aren’t very detailed. The style, I love it, very retro-chic. 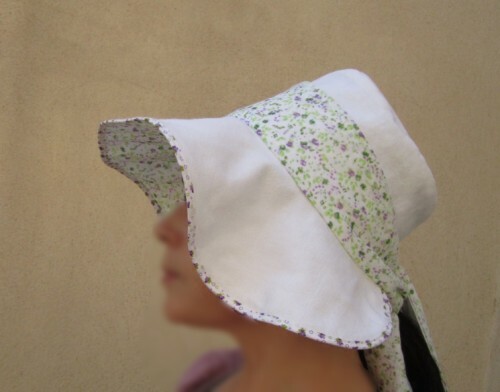 I love the large brim for sun protection. White linen for main fabric. Printed cotton voile for lining and white cotton voile for underlining it. I didn’t use self fabric to make the bias binding, I had some already made that was close enough. I did underline the lining as I used cotton voile and it was really too thin. I might sew it again but in this case I would take 1-1,5cm off the hight of the sides, I find it just a little to high for my head. I would definitely use canvas to interline. I just love the style of this hat ! And with a free pattern that’s a treat ! What do you mean, it fits the balloon better ???!! !